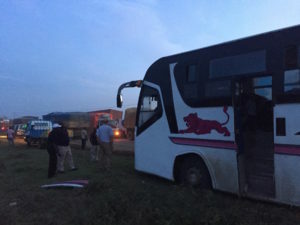 The trip had a lot of new transportation experiences for all of us, and almost every one has a story, so in this post I’ll relate just one of those: our trip between Nairobi and Mombasa. Cars, Tuktuks, Autorickshaws etc: many! 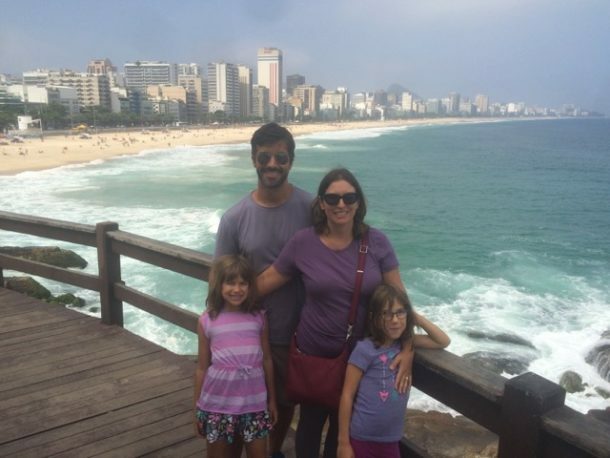 Our girls had their first subway ride in Rio. I rode on a motorcycle for the first time in Aleppey. None of us had ever been on a tuktuk or an overnight train. 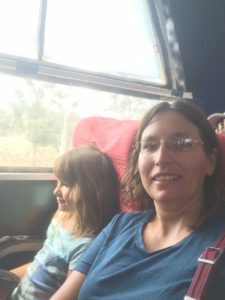 We had booked tickets in advance for the train overnight from Nairobi to Mombasa before our trip started. The first part of the journey was just getting from Imara Daima, close to the airport, to Nairobi Railway Station – a 9 km trip that could easily take 2 hours because we were driving in rush hour. After an uneventful, though slow, trip with our favorite driver in Nairobi, George (who is awesome) we arrived. George and others warned us to be very careful in the station as people may try to steal our luggage. So we were advised to keep an eye on things, stay in the 1st class waiting area, and be careful who we talked to! 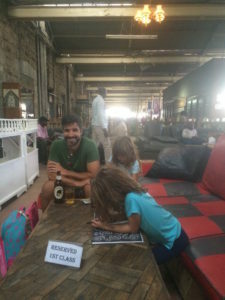 We paid a porter to bring our stuff inside (a good idea with any railway station, at least in Kenya or India – though those in South Africa I’d avoid) and enjoyed some snacks and drinks (Tusker lager – Kenya’s finest!) while waiting for our 7pm train. We were approached by a military officer – in combat uniform and carrying an assault rifle – who again kindly warned us to be careful and stay in the first class area. About 10 minutes before 7, a station employee informed us all that the train would not be running! A cargo train had derailed on the track and so they’d cancelled the train. We could either come back in 2 days for the next train, or arrange alternate transportation. We tried to get bus tickets that night – but they were already sold out. 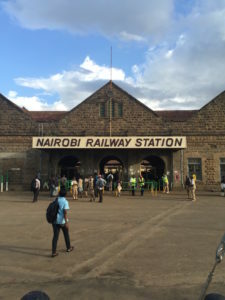 So a call to George, and a 2 hour wait in Nairobi Railway station while he fought traffic to come back and we were on our way back to our AirBnB. But, we did stop on the way to get bus tickets for the following morning. Modern Coast, direct from Nairobi to Mombasa – 10 hours on a bus, not ideal but at least we’d get there less than 1 day late. Bright and early the next morning, we went to the bus station with all our luggage. Things ran almost on time, the only problem was that the bus was not air conditioned – and while Nairobi has a reasonably temperate climate, Mombasa definitely does not! A bit cramped and no A/C but we’re on our way to Mombasa! The Mombasa Road (the only real highway between Nairobi and Mombasa) is 2 lanes – though in Kenya, that usually means you can squeeze in at least one more – especially with all those slow trucks (and busses) clogging things up. Lane splitting, unlike in most places, isn’t limited to smaller vehicles however, and our bus driver got impatient and decided to drive along the left shoulder off the road. Unfortunately the shoulder was soft mud. Also unfortunately our driver didn’t know how to drive in soft mud so we got stuck. Again our driver couldn’t drive in mud, so we weren’t going to get unstuck without help. 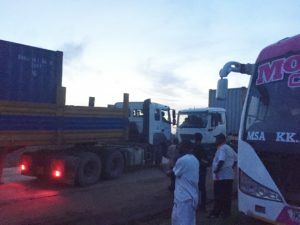 Now, the amount of traffic on the Mombasa Road meant that Modern Coast couldn’t get help out to us quickly (even if they had wanted to try – which, apparently, they didn’t!) The good news is that Kenyans are happy to try to help other vehicles stuck – at least busses. So a series of trucks stopped, and the bus crew and helpful drivers tried to tow us out with a chain. One of the first attempts resulted in part of the front bumper being torn off – to the chagrin of a British engineer who was also a fellow passenger and had tried to explain what a tow point is. Later attempts – including at least one military truck – did nothing much except to cause even more traffic disruptions. At one point the drivers were about to come to blows over it. I was in this lane first! It took over five hours for a towing attempt to finally succeed. By this point it was the middle of the night, and we were still 2 hours from Mombasa. Thankfully we reached the city without further incident – well, except for an angry taxi driver who the British engineer had helpfully called for us while we were stuck, and hadn’t called off. So the first person we met in Mombasa wasn’t very happy to see us! 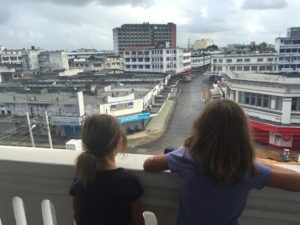 We did make it to Mombasa! Great post, great experience. The last part made me laugh, lots of don’ts. I hope you enjoyed your safari to kenya. Wow, amazing weblog format! How lengthy have you been blogging for? you made blogging look easy. The whole look of your site is magnificent, as smartly as the content! Thank you! I’ve been blogging for about a year and a half. 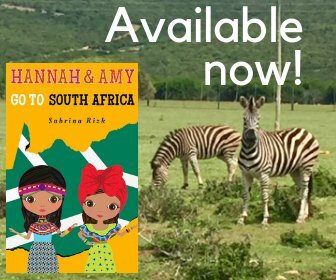 I initially started the blog to keep family and friends updated about where we were in the world. Hi there to all, it’s really fastidious for me to pay a quick visit this website, it includes helpful Information. Woah! I’m really enjoying the template/theme of this site. It’s simple, yet effective. A lot of times it’s challenging to get that “perfect balance” between user friendliness and appearance. I must say you have done a awesome job with this. Additionally, the blog loads super fast for me on Chrome. Excellent Blog! Thank you! I’m glad you found my blog and are enjoying it. Hi there, of course this post is actually good and I have learned lot of things from it regarding blogging. thanks. Usually I do not read article on blogs, but I wish to say that this write-up very compelled me to take a look at and do it! Your writing taste has been surprised me. Thank you, very great article. I simply want to tell you that I am just very new to blogs and actually loved your web page. Likely I’m planning to bookmark your blog post . You definitely have terrific articles. Bless you for revealing your web site. I simply want to mention I’m all new to blogging and absolutely loved this website. Most likely I’m likely to bookmark your site . You surely come with perfect articles. Cheers for sharing your website. Thank you! I’m glad you liked the post. It was quite an adventure! I just want to tell you that I’m all new to blogging and absolutely liked your blog site. Likely I’m likely to bookmark your site . You certainly come with good articles. Regards for sharing your website page. Thank you! I’m glad you like the blog and the articles. I simply want to say I’m new to blogging and site-building and seriously liked this blog site. Almost certainly I’m going to bookmark your blog post . You surely come with beneficial articles and reviews. With thanks for revealing your blog. You’re welcome! I’m glad you like the blog. I just want to say I am just newbie to weblog and honestly savored this web page. More than likely I’m planning to bookmark your blog . You actually have incredible articles and reviews. Bless you for sharing with us your webpage. I’m glad you like the site. Thank you for telling your friends about it. You’re welcome. I’m glad you liked the article.